Need more information about booking Home 7450869 ? 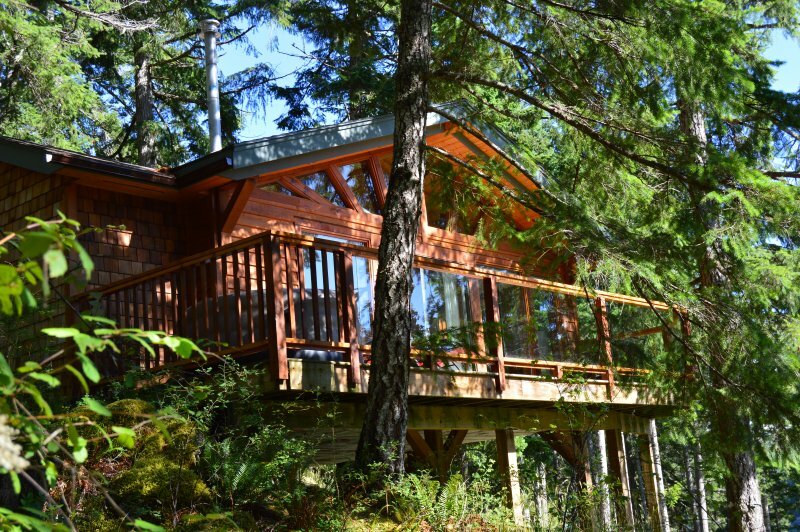 Cabin On The Cove is beautifully situated on Quadra Island, BC, the largest of the Discovery Islands. Visitors come in all seasons, drawn by the breathtaking coastal scenery and many recreational opportunities offered by this small group of islands located along the Inside Passage seaway between Vancouver Island and mainland British Columbia. Come, treat yourself to a comfortable stay in privately tucked away Cabin On The Cove. Watch seals play and eagles soar from your living room or deck. Hike local trails, beach comb or take a whale-watching tour. Relax in your private hot tub on the deck or curl up with a good book. The options to enjoy are many! Deep relaxation, rejuvenation and reconnection with nature, with a loved one, with yourself! Completed in 2015, the modern 600 sq ft Cabin is privately situated on our 3.6 acre property. Perched some 50 feet above the waters of Unkak Cove, the Cabin offers a stunning panoramic view of the cove, the forest opposite and Grouse Island in Quathiaski Cove. At night, the lights of Campbell River can be seen twinkling in the distance. The Cabin was mindfully designed as a comfortable get-away for two, with one bedroom with queen sized bed, a three piece bath with sensuous rainshower, fully appointed kitchen with dining nook overlooking the cove, and an ample living room boasting a gas fireplace for coziness and ambiance in any season. The deck overlooking the cove is furnished with a bistro set for al fresco dining, lounge chairs and your own private hot tub. The subtle deck lighting extends your enjoyment of this inviting outdoor living space well into the warm summer evenings. Winter is perhaps the most dramatic season to visit Cabin On The Cove. Watch the wind-whipped white caps roll up the cove from your cozy living room perch or steamy hot tub on the deck. The winter cove provides a favourite safe haven for a wide variety of sea birds for hours of your bird-watching entertainment. Cell reception is good in the Cabin, although we highly recommend you switch your phone “off” as much as possible to fully benefit from “getting away from it all” in this special, quiet spot among the trees and mossy bluffs above the cove. As your hosts, we will greet you on your arrival, give you the keys, provide you with a short tour of the cabin's amenities, answer any questions, indicate points of interest and show you the supply of brochures and maps provided for your use. If your stay is longer than four nights, we will arrange a time to come and service the hot tub mid-visit. We live on the property and are always available to answer questions or assist in any way. However, our practise is to give you privacy to enjoy your visit as you wish. The property has uneven terrain and drop-offs at cove's edge. It is therefore not suitable for young children. Neither has the Cabin been child-proofed so is not a safe environment for toddlers. We may consider a babe-in-arms or a mature child between 12 and 18 years of age, but can only provide a temporary cot to be used for sleeping. Contact us about suitability. Due to uneven terrain and a staircase leading to the Cabin, there is no wheelchair access. No outdoor fires allowed (deck BBQ OK). You can get in touch with Pat & Graham (the owner) through the contact form on this page. Send Pat & Graham (the owner) an email through the contact form on this page. Alternatively, if there’s a phone number on this page, you can call them. How do I contact Pat & Graham (the owner)? If you’ve already booked, go to Manage your holiday booking to view Pat & Graham the owner's contact details or send them a message. Or send Pat & Graham (the owner) an enquiry through the Contact the owner/manager form if you’d like a quote or more info first. When you pay online through the Book your stay form, a booking request is sent to Pat & Graham (the owner). You’ll find out within 24 hours whether they’ve accepted - no money will leave your account before then. You can also request a quote from Pat & Graham (the owner) through the contact form. The owner will email you the total cost for your dates and a link to book and pay online. Use the Book your stay form to pay provisionally online. You can pay by credit/debit card or PayPal. Pat & Graham (the owner) will have 24 hours to accept the booking and no money will leave your account before then. Why can't I call Pat & Graham (the owner) before booking? You’ll need to contact Pat & Graham (the owner) to do this. Send them a message in Manage your holiday booking or through the contact form on this page. You can request to change the dates or number of people on your booking via the Manage your holiday booking page. To change your holiday dates use the Edit booking button. If you need to change the number of guests staying then send Pat & Graham (the owner) a message. If Pat & Graham (the owner) agrees, they’ll send you a revised quote outlining the changes. You can review and accept/decline this from the Manage your holiday booking page. You’ll have 48 hours to take action before the revised quote expires.